jaden is an avid reader. he can spend over an hour reading through a stack of picture books. we check out dozens upon dozens of books every month at the library and usually end up purchasing only the ones he really loves. 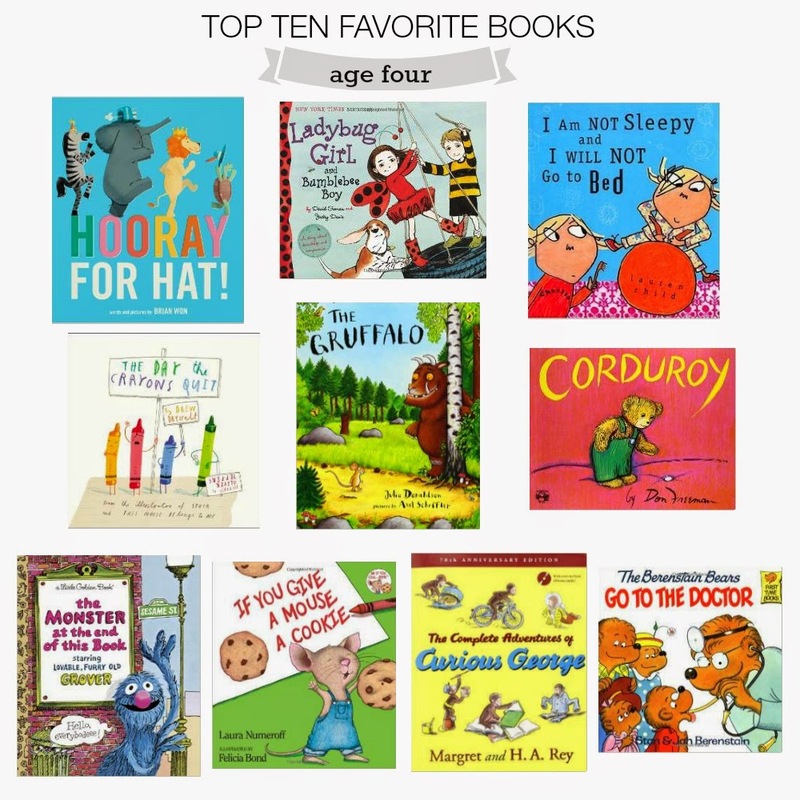 here are his current top ten favorite picture books (at the age of four and a half). Hooray for Hat: this is a new favorite in our house. a short and sweet story about friendship and sharing with super cute illustrations. the kids have spent countless afternoons marching around the house with hats and beanies on their heads shouting "ding dong! hooray for hat!" also, the other day, in an attempt to cheer up her older brother, everly put a hat on jaden's head and whispered, "hooray for hat, jayjay?" totally melted my heart that she understood the concept of spreading happiness. Ladybug Girl and Bumblebee Boy: this is currently jaden's absolute favorite book. he loves the entire ladybug girl series but especially loves the ones with bumblebee boy because he can relate to the boy character. the book is about lulu and sam who cannot agree on what to play together and i love how they figure out (without adult intervention) how to work together to create fun games that they both like to play. Charlie and Lola series: jaden loves the entire series and the tv show. charlie is the patient older brother and lola the stubborn little sister. each book starts off with charlie saying: "i have this little sister, lola. she is small and very funny" and i think jaden relates to charlie because everly is exactly like lola! the stories are always endearing and entertaining. The Day the Crayons Quit: jaden was not a fan of this book a year ago. he didn't really catch on to the humor of the crayons who go on a strike and list their grievances in a letter to their owner, Duncan. but now that he's older, jaden thinks this book is hilarious! and the best part....he now respects his crayons and doesn't peel off their wrappers! win-win! The Gruffalo: this is a clever story about a smart little mouse that saves himself from being eaten by a fox, an owl, and a snake by inventing a fake monster called the gruffalo. but much to his surprise, he runs into a real life gruffalo that wants to eat him and the mouse devises a plan to scare the monster away. super witty and creative! Corduroy: i loved this book growing up and now so does jaden! a picture book classic. The Monster at the End of this Book: fun and silly interactive book where grover begs the reader not to turn the page...because there's a monster at the end of the book! but of course, the monster is none other than grover himself. both of the kids love this one, and they think each page is hilarious. If You Give a Mouse a Cookie: there's good reason this award winning book is one of the most popular children's book of all time. the illustrations are packed with humorous detail. the classic story of a little mouse that wears out an energetic little boy never gets old! this is a favorite bedtime read for both jaden and everly. Curious George series: curious george holds a special place in my heart because he's been jaden's favorite character since the age of two. the question here is...do you know the name of the man in the yellow hat?? Berenstain Bears series: i remember reading the berenstain bears when i was younger and wish i kept all my books because i had so many from this series. even though the berenstain bears have received some criticism for promoting outdated gender stereotypes (papa bear works and mama bear tends to the house), we still love these books because each story teaches a valuable lesson. and if you're interested here's: jaden's favorite books at age three and everly's favorite books at age one.